The deadline to file your tax return is quickly approaching, so it's a good idea to wrap things up and double check for any deductions or credits you might have missed. It's extra important to pay close attention and make sure you're getting the most of deductions this year. 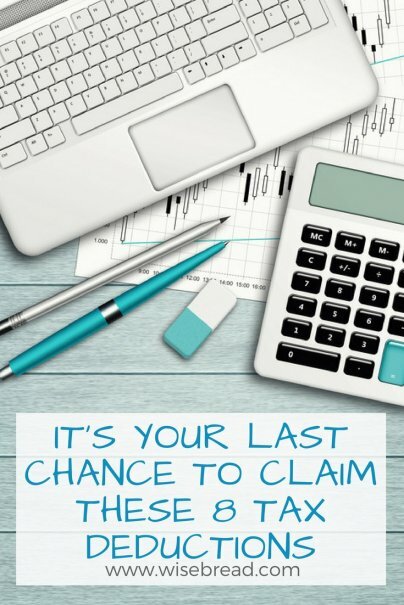 The Tax Cuts and Jobs Act eliminates several popular deductions for the 2018 tax year, which means this is the last chance you'll have to claim them on your return. If you were not reimbursed for required work expenses, such as a job uniform, work-related education, business travel, or union fees, those costs are tax deductible for tax year 2017. The new tax law eliminates this deduction. If you've moved in the last year for work, you may be able to deduct certain expenses like hiring movers or renting a truck. To qualify under the current rules, you must have moved at least 50 miles from your previous address, your moving date must correspond to when you started your new job, and you must work full-time for at least 39 weeks during the first 12 months after your move. This deduction will no longer be available for the 2018 tax year and beyond. The new law eliminates your ability to deduct tax preparation expenses, such as the cost of using software or hiring someone to do them for you. If you spent money for tax preparation in 2017, this will be your last year to claim that deduction. Under the current tax law, you can deduct any casualty and theft losses that you experienced during the tax year. For individual taxpayers, you can deduct losses due to a fire, storm, or from theft. Under the new law, you will only be able to deduct casualty losses if the loss is attributable to a disaster as declared by the president, such as a hurricane. If you've gone through a divorce and you pay alimony, the money you pay your former spouse under a divorce or separation agreement is currently tax deductible. Depending on how much you pay in alimony, the tax deduction can be significant. Under the new tax plan, alimony payments will no longer be deductible. The change will apply to any divorce or separation that occurs after December 31, 2018. With the current tax structure, you can claim a personal exemption of $4,050 for yourself, your spouse, and each of your dependent children. The new tax plan eliminates personal exemptions. Instead, the plan increases the standard deduction from $6,350 to $12,000 for single filers, from $12,700 to $24,000 for married filing jointly, and from $9,350 to $18,000 for heads of household. Although some people will benefit from the change to a higher standard deduction, the elimination of the personal exemption could hurt families with multiple children, lower incomes, or single parents. Currently, you can deduct the interest you paid on a mortgage or home loan balance as large as $1 million. For mortgages that originate after December 15, 2017, the limit is lowered to $750,000. Although that number is still high, it could affect homeowners in areas with sky-high real estate prices. Current law allows you to deduct the full amount of either your state income taxes or state and local taxes. You can also deduct property taxes. For those in areas with a high cost of living, this deduction is a significant help. The new tax law merges the three taxes together and caps the deduction at $10,000. With a smaller deduction available for state and local taxes, some families could face a higher tax bill.